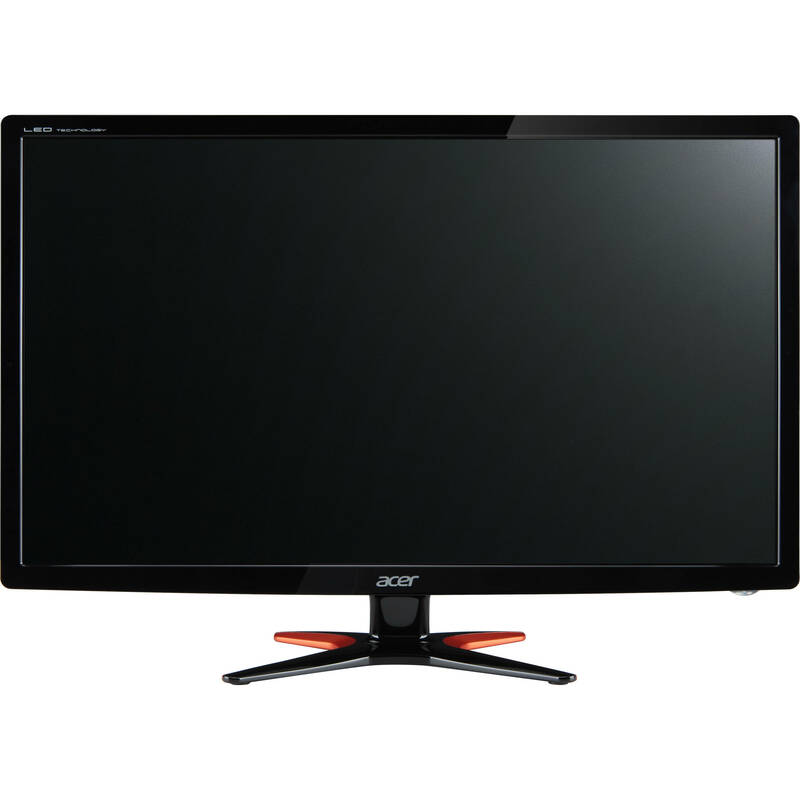 With a 1920 x 1080 Full HD resolution, the GN246HL Bbid 24" 16:9 LCD Monitor from Acer displays smooth video playback and crisp images. In addition to the Full HD resolution, viewers benefit from a 1 ms response time and 144 Hz refresh to virtually eliminate ghosting and blur when playing games or viewing movies and videos. Acer has even incorporated 3D LightBoost technology into this display to further enhanced the gaming experience with enhanced brightness and reduced ghosting when playing 3D games. Setup and configuration of this 24" TN monitor is simple as it comes equipped with HDMI, DVI-DL, and VGA connectors to connect to nearly any computer configuration. Once connected the display can be attached to the included stand or mounted using a VESA compatible mount. Regardless of the screen orientation users can see it from nearly any angle with support for 170° horizontal and 160° vertical angles. Please note that a 144 Hz refresh rate is only achievable via DVI-DL. Box Dimensions (LxWxH) 24.0 x 16.0 x 6.0"
GN246HL Bbid 24" 16:9 LCD Monitor is rated 4.5 out of 5 by 39. 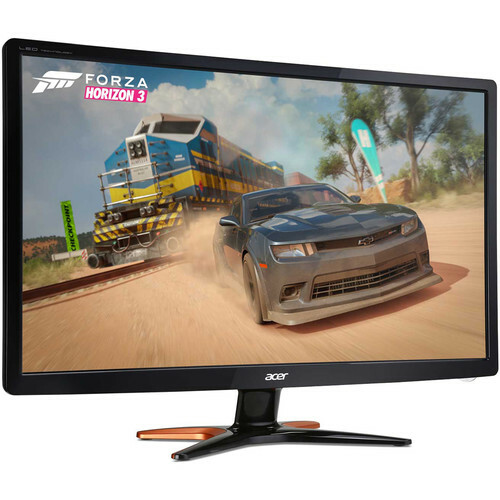 Rated 5 out of 5 by Surry from Unparalleled gaming experience Paired with a suitable cpu and GPU, this monitor provides 144fps with a 1ms response time. It isn't plastered with sync this and blah blah branding, but it gets the job done like nothing else. Finally, driving in a video game has the same frame rate as real life. But be careful. Once you experience this, 60fps will feel laggy and unresponsive, such as when you are using your cell phone, or another computer. Once you go 144fps, there's no turning back. The one issue is that it isn't an IPS monitor, so don't get it to view the monitor with other people. Sitting in different places, the image fades at different viewing angles. But it's solid for sitting directly in front of it, with your eyes at level, or above the monitor. Rated 5 out of 5 by Saoroeun from Greatest Budget 144Hz Monitor,DVI-cable=144Hz(HDMI,vga=60Hz) Received mine with no problem what so ever(dead pixel or damage part) include required cables, will be elaborating later. Great picture quality. Great intro into 144Hz monitor, all games that screen tear are gone. Frame rate on some game did dip but it's expected upgrading from an old standard 1280x1024. One negative thing is I would like to have been informed with documentation or in the quick setup manual that 144Hz refresh rate work only with DVI-Dual link cable-bonus points for them is Acer supply you one in the box. Rated 5 out of 5 by RogueFox from Great Picture for Reasonable Price I'm very satisfied with my product for the price. Rated 5 out of 5 by Anonymous from Pleasantly Surprised I was apprehensive about this purchase. Unsure that an incredible deal for a 144hz monitor could live up to my expectations. As the title says...I am surprised. I came from gaming on a 4k HDR 55 Samsung TV. Picture was beautiful, vibrant and blacks were inky. With that said, going to this could be consider a down grade in most comparisons. I'm not missing 4k... After lowering brightness to 40 and adjusting vibrancy to 60 in nvidia panel, the images look great. I also managed to get lightboost to work with toastyx's software help. Unfortunately, the trade off on image quality and ghosting was not worth it for me. All frequencies work great...144,120,110,60. There were no dead/stuck pixels. No damage to parts or packaging. It also appears the more I use the monitor the less I notice the minimal ghosting at 144 hz. I have also found it to help in game to play at 120hz. My only regret is that I may have enjoy a 27 since I underestimated my experience at 55 4k on KS8000. Beyond manufacturing defects...anyone who would not recommend this monitor is a snob! Rated 5 out of 5 by Andrew from Amazona Quality I currently have a dual monitor setup right now because of this monitor. My old monitor was really degrading but this new one really opened my eyes as a photographer to color grading and contrast. Rated 3 out of 5 by Derek Sr from Arrived with a dead pixel My son wanted this for the faster refresh rate that his gaming rig needs. It works just fine however we found the dead pixel the first day. Quality control for the manufacturer should have caught this before the item left the factory. The B&H aspect of the purchase went fine. They made it easy to find, the price was right and they shipped it promptly. This dead pixel though. I recommend B&H I do not recommend this monitor. Rated 5 out of 5 by Maxwell from Works great, as promised Bright, high quality, 144Hz, quick response time, inexpensive. What more could you ask for? Does it come with speakers included? what color is the monitor? This model looks all black but i've seen other ones that are black and red. GSync is not supported by this monitor, however does support Nvidia Lightboost, which can be 'Hacked' to be enabled in 2D mode for an effective elimination of motion blur. see Blurbuster's article on hacking 'Lightboost' and follow the EDID Override method. which will allow one to run 2D in 120hz but with literally zero motion blur,to see the benefits of this feature your game will also need motion blur and vsync disabled. particularly useful in FPS games such as CS:GO although will mess with screencap software with a strange double image, as it is faking 3D mode. **NOTE: this process may very well void warranties and may cause issues with your Windows system, registry edits are necessary for the lightboost hack to function, this is only recommended for users which know how to undo these changes on their own and accept responsibility for whatever issues may arise after attempting such a change. Acer, Individuals at Blurbusters, nor Myself will accept responsibility for ANY issues you have following an attempt at this process. is this monitor good for gaming? This monitor is Excellent for gaming, but you have to make sure the Monitor, your Display adapter/Driver, and the game itself are all configured properly for whichever configuration you are going for. Your rig must be able to run games at framerates higher than 144 to see any performance improvements, 144hz must be enabled in the display adapter, to enable 144hz you must be using the DVI-D cable for the option to even be present in your adapter properties.-See the BlurBusters article on 'Hacking' the monitor to enable Lightboost in 2D mode, this particular monitor required the 'EDID Override method', which will allow one to run 2D in 120hz but with literally zero motion blur,to see the benefits of this feature your game will also need motion blur and vsync disabled. particularly useful in FPS games such as CS:GO although will mess with screencap software with a strange double image, as it is faking 3D mode. **NOTE: this process may very well void warranties and may cause issues with your Windows system, registry edits are necessary for the lightboost hack to function, this is only recommended for users which know how to undo these changes on their own and accept responsibility for whatever issues may arise after attempting such a change. Acer, Individuals at Blurbusters, nor Myself will accept responsibility for ANY issues you have following an attempt at this process. Does this come with a Display Port? Yes, this connection type is necessary for the 3D features this monitor supports.